In today’s marketplace there is a wide variety of products available to those who want the security and profit potential of gold. If you are contemplating an investment in gold, you should give the same careful thought to your options as you would to any other important financial decision. First of all, to truly benefit from the unsurpassed security of owning gold, you should understand that the only way to accomplish this objective is to own physical gold. Other gold investments, such as exchange-traded funds (ETFs), gold mining shares and gold accounts provide investors with exposure to movements in the price of gold, but do not provide the security that only physical gold can provide. In order to buy gold you need to understand that there are two types to choose from. Individuals can select from a broad array of gold and silver bullion coins issued by governments around the globe. Examples are the Gold American Buffalo, the Gold American Eagle, the Canadian Gold Maple Leaf, the Austrian Philharmonic, the South African Krugerrand and several others. The current market value of a bullion coin is determined by the value of its gold content, plus a premium that varies between coins, dealers and market conditions. These bullion coins are most commonly available in 1/10, 1/4, 1/2 and 1 ounce sizes. One should be aware that the premium tends to be higher for smaller sizes. Gold and silver bars are also available in a wide assortment of weights and sizes, ranging from as small as one gram to 400 troy ounces (the size of the internationally traded London Good Delivery bar). For individuals looking to take physical delivery of their precious metals, the 400-ounce bars lack the convenience, portability and practicality of coins and smaller bars. Bars are manufactured by literally dozens of internationally recognized refiners around the world. The spot/indicator price of gold has increased exponentially from the $20 per ounce price at which American Double Eagle coins were originally struck! For a free gold information kit please click here. When considering owning gold bullion, you should be aware that the U.S. has had bans against or financial disincentives for the private ownership of gold in the past. 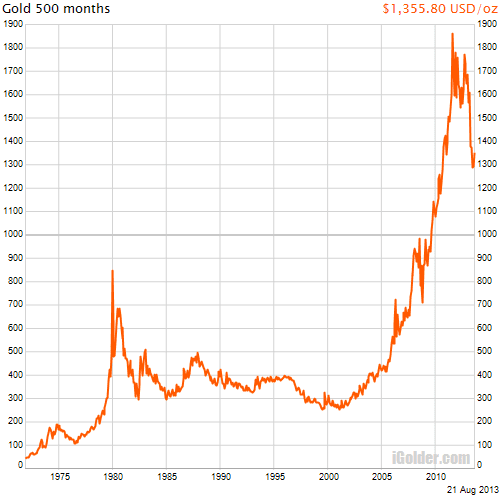 This is one reason why the U.S. government has reporting requirements for bullion transactions. America has had four gold confiscations over the course of our history, including the one which was ordered in 1933 at the height of the Great Depression. In that year, under the authority of the Emergency Banking Act, President Franklin Delano Roosevelt issued Executive Order No. 6102, which ordered all privately owned gold bullion and bullion certificates in the United States be confiscated by the government. In return for their gold, Americans would receive paper money.